It's hard to believe that 25 years have elapsed since the release of the eponymously named, smash debut record from Seattle-based post-grunge rockers, Candlebox. The eleven-song chartbuster is as fresh today as it was in 1993. Founding member/lead singer Kevin Martin joked on stage at The Plaza Live that the milestone anniversary meant that some of us were as old as he was. While that may be true, the no-holds-barred frontman still has the chops and the audience appeal to perform as if it IS still 1993. Delivering a 90-minute blazing set for the packed, standing-room-only sea of fans, Martin and his band proved that not only do they still have it, they totally own it. Backing Martin on this tour are guitarists Brian Quinn and Island Styles, bassist Adam Kury and drummer Dave Krusen. At 8pm, openers Whole Damn Mess followed by State To State got things rapidly moving with 30- and 45-minute sets, respectively. Both bands offered intense, high-energy performances that had the crowd completely engaged. To everyone's delight, Candlebox's Martin came out and sang (and danced!) with fabulous frontman Don Miggs and Whole Damn Mess. After a quick 15-minute break, State To State took the stage ahead of the headliner, Candlebox. At 10pm, Candlebox burst onto the stage and splintered the walls with songs spanning their catalog. Martin's heavy audience interaction and intermittent f-bombs only added to the appeal of the band's 90-minute set. Cuts from the latest record, Disappearing In Airports (2016) included "Crazy," "Vexatious" and "Supernova," but single tracks from other albums were mixed in as well. 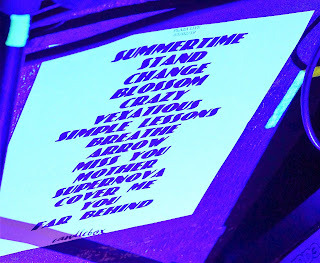 The band opened with "Sweet Summertime" (inspired by the Guns N' Roses song, "Sweet Child O' Mine") from Love Stories and Other Musings (2012) and additionally performed "Simple Lessons" from Lucy (1995). Also on tap were three songs from Into The Sun (2008) including "Stand," "Breathe Me In" and "Miss You," a song Martin wrote for his father, a Vietnam veteran who died 13 years ago at the age of 81. Martin thanked veterans for their service and then launched into the heartbreaking homage while playing acoustic guitar. Fan favs from Album One were, of course, heavy in the set list, including "Change," "Blossom," "Arrow," "Cover Me" and "You." During "Cover Me," Martin brought out a young man named "Sean" to sing the opening lines, and naturally he slayed it. The surprise of the night was a mind-blowing cover of the Roger Waters-penned Pink Floyd classic, "Mother" off The Wall (1979). Opting to play straight through with no official "encore" break, the band closed it out by 11:30pm with "Far Behind." Martin discussed how he wrote the song for his good friend, the late Andrew Wood, a member of Malfunkshun and then Mother Love Bone, an up-and-coming group on the Seattle scene in the late 1980s into 1990. The collective came to an abrupt end after Wood's untimely death at age 24 due to a heroin overdose. "This is not a love song. You guys have loved it for 25 f-ckin' years - thank you from the bottom of my black f-ckin' heart!" The entire crowd belted out the lyrics right along with Martin. There was an almost tangible electricity coursing throughout the venue, wrapping up a phenomenal show.